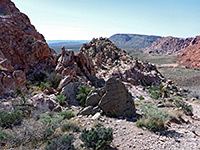 Calico Basin is a flat area on the east side of the Calico Hills at the edge of Red Rock Canyon National Conservation Area, enclosed on three sides by rocky, brightly-colored slopes - generally red to the west, more pink and orange to the north and south. A paved road accesses the basin from Hwy 159 (Blue Diamond Road), through a small residential area to a trailhead at the foot of the hills, from where several paths depart, some to the central area of the hills, to the southwest, and two to the north, forming a 3.2 mile loop around the detached summit of Kraft Mountain, an elongated peak rising over one thousand feet above basin. 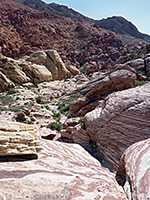 About two thirds of the Kraft Mountain Loop crosses open slopes, giving fine views of the basin, the hills and the more extensive flat lands towards Las Vegas, though best is the northern third, as this runs along the floor of a moderately narrow ravine (Gateway Canyon) which cuts though especially colourful rocks; generally pale grey, pink, red or orange but crossed by thin, closely spaced darker bands, or in other places speckled with small dots. 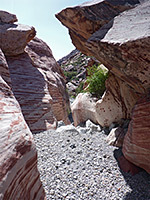 The streambed contains a few obstacles created by chokestones and dryfalls, just testing enough to make the hike more interesting. The drainage is in general fairly dry; there are only a few residual pools after rainfall, and no springs in the vicinity. 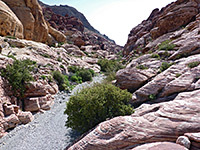 The wash is easiest to follow downstream rather than upstream hence clockwise is the recommended direction - from the basin, up a steep slope to a saddle and down a little way to the upper end of the ravine, then along the canyon to its mouth and back across open land at the foot of the mountain, past some boulders adorned with petroglyphs. There is no official trail to the mountain itself though its summit can be reached by scrambling, and the steepest section, on the south side, is a popular location for bouldering and rock climbing. 16 views along the Kraft Mountain Loop. 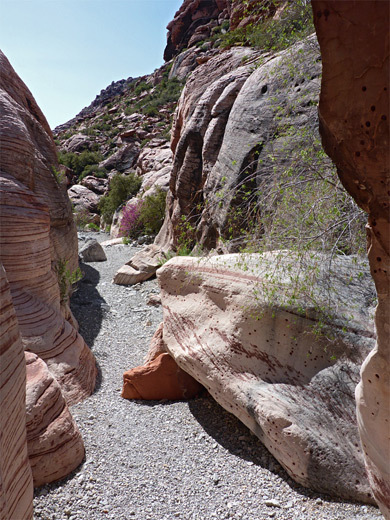 The Kraft Mountain trailhead is 1.9 miles from Hwy 159 along Calico Basin Road, which runs initially alongside a dry wash, bridging it twice, then crosses the residential area to the parking lot, which although still quite large often fills up at busy times. Other spaces are available on verges towards the end of the road. This section of the NCA is free to enter. There is one other trailhead/picnic area nearby at Red Spring, one of several seasonal water sources along the edge of the basin, at the foot of the hills. A gravel track continues westwards from the parking area, heading towards the Ash Canyon Trail which links with the Sandstone Quarry trailhead along the scenic loop road, while the route to Kraft Mountain is north, initially along another old vehicle track. This stays fairly level for a short distance, until a narrower path starts to climb the greyish, boulder-strewn slope ahead, aiming for a pass between the mountain and the central area of the hills. There are several other criss-crossing paths on both sides, but the target is quite obvious. The ascent is steep, 500 feet, though relatively brief, climbing alongside a gully that has a few stripy rocks around its upper end, then leveling out at a saddle. The descent on the far side is shorter and less steep, and the trail soon reaches a junction. 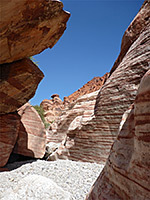 The main route is straight on, continuing a gentle descent to the stony bed of Gateway Canyon, while right is a short-cut, joining the wash a third of a mile downstream; this follows a tributary ravine, while bypassing a few dryfalls and potholes. Once on the streambed, the loop continues downstream (east). The wash has a few small drops then a larger dryfall, climbable with care or (more usually) passed on the right, descending over several smaller boulders. 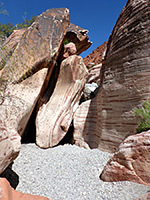 At first, most of the surrounding rocks are plain, or spotted, though they soon become predominantly stripy, the bands sometimes straight, sometimes curving. All are composed of Aztec sandstone. Below the biggest drop are a few smaller obstacles before the drainage widens and a path leaves the wash bed, traversing the hillside to the south, becoming nearly flat. 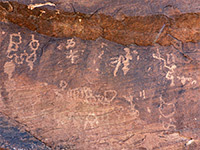 The petroglyph area is below the east edge of the hill, identifiable by a notice stating that it is currently closed. The region popular for bouldering is just beyond, extending uphill to a line of cliffs. The final section of the path crosses sandy flats back to the parking lot.